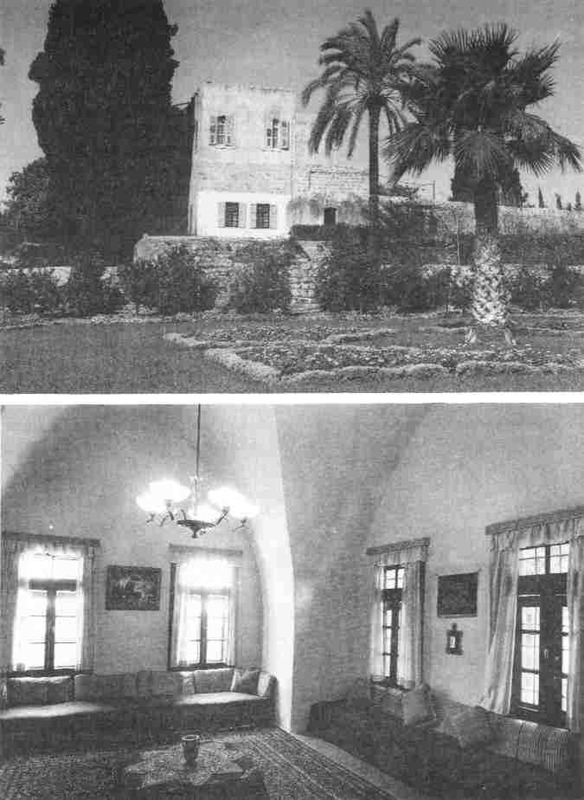 In addition to Mazra'ih 'Abdu'l-Bahá had earlier on rented the Garden of Na'mayn, an island situated in close proximity to the city of 'Akká. He did this in anticipation of Bahá'u'lláh's release from confinement. After His release Bahá'u'lláh often visited this beautiful spot, usually in the spring, the summer and early autumn seasons. 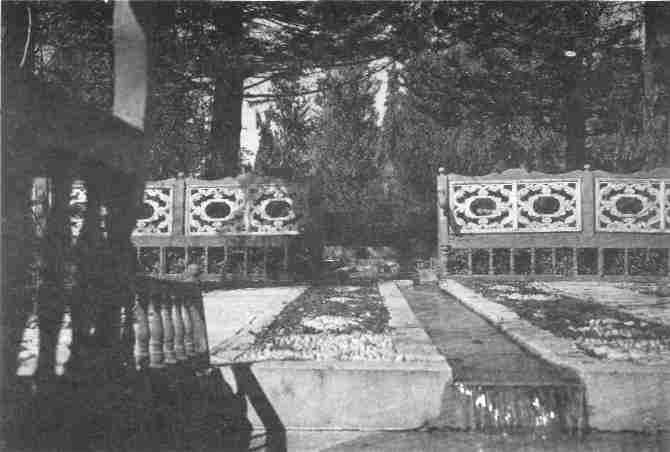 It was designated by Him as the Ridván Garden (Paradise); in some of His Tablets Bahá'u'lláh refers to the garden as the 'New Jerusalem' and 'Our Verdant Isle'. This garden was made beautiful through the dedication and hard work of the Persian believers and the constant supervision and guidance of the Master. They brought great quantities of soil from neighbouring places to make flower-beds all around, while from Persia and neighbouring countries the friends brought many shrubs, trees and flowering plants, some of them rare species. Crossing mountains and deserts, which took several months, they took such care that the plants arrived fresh and ready to be planted in the garden. The care with which the believers brought these plants by long hazardous journeys is an indication of a devotion and a love which finds no parallel in the annals of any religion and which is clearly demonstrated in the beauty of the garden itself. which had been one of His favourite flowers in Tihrán. In some of His Tablets Bahá'u'lláh refers to these plants and expresses warm appreciation of the devotion of those who brought them. The zeal and devotion of the gardeners who tended the plants and laboured day and night to make the Garden of Ridván a place of beauty for Bahá'u'lláh to enjoy, was no less striking. The Garden of Ridván was situated on a very small island. The little river, which emptied into the sea, divided itself into two streams surrounding that small area of land. In the time of Bahá'u'lláh the garden was laid out in flower-beds and there were many ornamental shrubs and fruit trees. There was a splashing fountain from which water was fed to all parts of the garden. As it flowed, it came rippling down in a broad stream over a stone platform under two large mulberry trees. The stream which flowed by the island was about fourteen to fifteen feet wide and three feet deep; fish were darting about it in abundance. It was fringed with weeping willows, and the fragrance of jasmine and orange blossoms filled the air. Most of these features are preserved today, except that there is no water circling the garden, for the streams have been diverted in recent times. Whenever Bahá'u'lláh visited the Garden of Ridván it was a joyous occasion not only for Himself but for the Master and all the friends. The atmosphere in this oasis of beauty brought some relaxation to Bahá'u'lláh as He sat on a rectangular bench placed in the shade of the two large mulberry trees. Many believers attained His presence there, and they too sat on similar benches. meeting with Him took place in the Garden of Ridván. He was overwhelmed by this vision so suddenly and vividly revealed to him. It came upon him as a thunderbolt and he was carried away into a different world. His whole being was stirred to its depths as he saw himself, standing with awe and wonder in the presence of the Lord of the Old Testament. His instant urge was to prostrate himself at the feet of Bahá'u'lláh, and this he did. The effect of this first meeting, and of hearing the utterances of Bahá'u'lláh on that occasion, was to create a fire of love and adoration which continued to burn within his heart till the end of his life. He was transformed into a new creation and was exultant with joy as he left the Holy Land. Ridván, which had been prepared for Him with such loving care by the Master, the friends, and the pilgrims! The Master's heart was gladdened indeed to see the enjoyment of His beloved Father, resting under the big mulberry tree, by the side of the little river rippling by, the fountain which they had contrived splashing and gurgling in sounds refreshing indeed after the long years of confinement in the pestilential air of the penal fortress of 'Akká. Only those who were present there could realize in any degree what it meant to be surrounded by such profusion of flowers, their colours and their scents, after the dull walls and unfragrant odours of the prison city. I remember well the greatest of our joys was to go with Bahá'u'lláh for the occasional picnics to the Ridván. There were many occasions when the believers held feasts in that garden and Bahá'u'lláh honoured them with His presence. Such gatherings engendered indescribable joy and spirituality, beyond our imagination. The garden became truly a place of celebration and rejoicing. Siyyid Asadu'lláh-i-Qumí,* an eminent believer, has related that once Bahá'u'lláh Himself entertained all the believers with refreshments in the Garden of Ridván to celebrate the release of several Bahá'í prisoners in Tihrán. These included Mírzá Abu'l-Fadl, the Hand of the Cause Hájí Mullá 'Alí-Akbar,† and Siyyid Asadu'lláh himself. In His all-embracing knowledge Bahá'u'lláh had announced their release and celebrated the occasion, whereas the telegram bearing this news reached 'Akká a day later. * see vol. 1, pp. 35-6, and below, pp. 185-7. † see vol. 3, also below, pp. 258-70, for Mírzá Abu'l-Fadl; for Hájí Mullá 'Alí-Akbar (Hájí Ákhúnd) see below, pp. 294-301. Upon Our being seated, Rádíyih, upon her be My glory, attained Our presence on thy behalf, laid the table of God's bounty and in thy name extended hospitality to all present. In truth, all that which stimulateth the appetite and pleaseth the eye was offered, and indeed that which delighteth the ear could also be heard as the leaves were stirred by the Will of God, and from this movement a refreshing voice was raised, as if uttering a blissful call inviting the absent to this Feast. God's power and the perfection of His handiwork could enjoyably be seen in the blossoms, the fruits, the trees, the leaves and the streams. Praised be God who hath thus confirmed thee and her. * see vol. 2, pp. 9-10. We send greetings to His loved ones, and supplicate for each one of them that which is worthy of mention and is acceptable in His presence. Peace be upon thee, and upon God's sincere servants. Praise be to Him, the Lord of all mankind. Rádíyih, who is mentioned in this Tablet, was a sister of Munírih Khánum, the wife of 'Abdu'l-Bahá. The dinner was given on behalf of her husband who was not present at the time. He was her cousin Siyyid 'Alí, the only son of Mírzá Hádí, a distinguished Bábí, and the illustrious Shams-i-Duhá. Mírzá Hádí, an uncle of the King of Martyrs and the Beloved of Martyrs,† became an ardent believer in the early days of the Faith. He was present at the Conference of Badasht, suffered persecutions, was attacked in that vicinity and died there. His wife Shams-i-Duhá, a close companion of Táhirih, was described by 'Abdu'l-Bahá as the 'eloquent and ardent handmaid of God'. * see Memorials of the Faithful, pp. 175-90. † see below, ch. 5. ‡ In a Tablet to His Trustee, Hájí Amín, Bahá'u'lláh indicates that a 'Tablet of Trustworthiness' had been revealed in AH 1296 (around An 1879). § see below, Appendix II and p. 333.
uses this symbolism to describe the revelation of some of the attributes of God. * In others, the term may have different significances which only the deep study of the Holy Writings can reveal. * For example, see vol. 1, p. 242, and vol. 3, pp. 223-4. † see below, ch. 4. 5. Tablets of Bahá'u'lláh, p. 37, pp. 121-2. 7. Tablets of Bahá'u'lláh, p. 37. 'A lovely place, surrounded by gardens' (above). received his guests and dictated to his amanuenses. the side of the little river rippling by...'. indeed after the long years of confinement'. * Some Tablets of Bahá'u'lláh are composed in such a way that a part of the Tablet is in the words of His amanuensis, but in fact was dictated by Bahá'u'lláh to appear as if composed by the amanuensis. Every word of the Tablet, therefore, is from Bahá'u'lláh Himself. For more information see vol. 1, pp. 40-42. † A brief account of the life of Siyyid 'Alíy-i-Yazdí is given in Chosen Highway, pp. 131-2.
and later died. As already mentioned, the other son, Hájí Muhammad, established a business with two other believers in Alexandria. And the youngest son, Ahmad Effendi, was given the honour by 'Abdu'l-Bahá of marrying His youngest daughter. In the Tablet mentioned above Mírzá Áqá Ján gives the story of the events following Shaykh 'Alí's death in Khartúm. He says that when he died the Persian Consul sent the full account of his assets to the commercial attaché of the Persian Embassy in Cairo who in turn demanded the payment of the death duties required by law. Shaykh 'Alí's younger brother Hájí Muhammad and one of his partners Siyyid 'Alí, who are both praised in this Tablet by Bahá'u'lláh for their trustworthiness, assured the authorities that they would fulfil their obligation in this regard. A number of leading merchants of the city also assured the Persian attaché that the Bahá'ís were trustworthy people and would honour their obligation. This episode coincided with the bombardment of Alexandria by British forces in 1882 when a great part of the city was ruined and the business house of Hájí Muhammad, together with all its goods, was utterly destroyed. The two men returned to the Holy Land almost penniless. They succeeded, however, in obtaining a sum of money sufficient to pay their debt to the authorities. Siyyid 'Alí travelled to Cairo and although by then the former commercial attaché had been dismissed from his post, he presented the sum of fifty English guineas* to his successor. Both the merchants and the embassy officials were deeply touched by this action. Knowing that the partners' business had been completely wiped out, the commercial attaché at first refused to accept the money. He is reported to have said that this noble act of honesty demonstrated by the Bahá'ís was sufficient for him. However, in the end he took the money and stated that the best reward in this transaction was that the enemies of the Faith were praising the conduct of its followers. * An obsolete English gold coin. Its value was finally 21 shillings. believers as the king of goodly deeds. He prays that His followers in every land may manifest the spirit of trustworthiness among the people. The story of Hájí Muhammad would not be complete without referring to one of his noble qualities, namely, his utter obedience to the Centre of the Cause. There was a time when Hájí Muhammad had a business concern in 'Akká. One day he was sitting in his office when the Master arrived with an urgent instruction from Bahá'u'lláh that Hájí Muhammad should immediately proceed to Jaddih (Jiddah) in Arabia. He asked 'Abdu'l-Bahá if he could be permitted to attain the presence of Bahá'u'lláh before departing for Jaddih. The Master told him that there was no time, for the boat was leaving at any minute. Hájí Muhammad at once closed the office, and without even paying a visit to his family boarded the ship which sailed away almost immediately. Once on board, he realized that because of the extraordinary rush, he had not even thought to ask the Master the purpose of his trip to Jaddih. But now it was too late, and he knew that Bahá'u'lláh would guide his steps when he arrived in that city. This is the best example of instant, exact and complete obedience to the command of Bahá'u'lláh. * For Hájí Mírzá Haydar-'Alí's life and imprisonment see vol. 2. Concerning trustworthiness, 'Abdu'l-Bahá in a Tablet to Hájí Áqá Muhammad-i-'Aláqih-band, a devoted Bahá'í from Yazd, states that should a believer succeed in carrying out all goodly deeds but fail, even to a small measure, in trustworthiness and faithfulness, all his good deeds will be void. * see below, pp. 304-12. Some believe that a loving God need not be feared. In a previous volume* we have discussed the significance of the fear of God and explained that without it the believer cannot have the strength to sever his attachment to the material world and fix his gaze upon the heavenly abode of his soul. 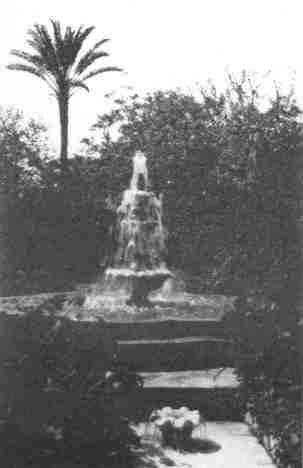 There are many anecdotes about Bahá'u'lláh in the Garden of Ridván. 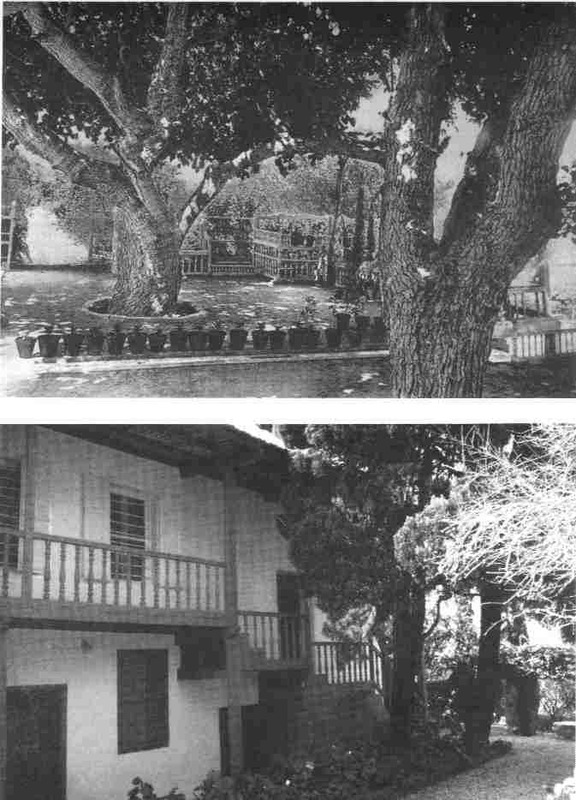 The following is an account by May Bolles Maxwell† describing in beautiful language her impressions of the garden when she visited it during her pilgrimage. May Maxwell was among the first group of pilgrims from the West to visit the Master in 1898-9. She may be regarded as one of the few spiritual giants of the Faith in the Western world. When she passed away Shoghi Effendi, the Guardian of the Faith, described her as ''Abdu'l-Bahá's beloved handmaid and distinguished disciple' and bestowed upon her the rank of martyr. * see vol. 2, pp. 94-6. † For a brief story of her life see Bahá'í World, vol. VIII, pp. 631-42. After driving for about half an hour we reached the garden where Bahá'u'lláh spent much of His time during His long years of exile in 'Akká. Although this garden is small it is one of the loveliest spots we had ever seen. Bahá'u'lláh frequently said to His gardener, Abu'l-Qásim, 'This is the most beautiful garden in the world.' With its tall trees, its wealth of flowers, and its fountains, it lies like a peerless gem surrounded by two limpid streams of water just as it is described in the Qur'án; and the atmosphere which pervades it is so fraught with sacred memories, with divine significance, with heavenly peace and calm that one no longer marvels to hear of the traveller who, passing one day before its gates, paused and gazing in saw Bahá'u'lláh seated beneath the shade of the mulberry trees, 'that canopy not made with hands,' and remembering the prophecy in the Qur'án, he recognized his Lord and hastened to prostrate himself at His feet. and went into the garden and stood beneath the trees covered with the insects. Then He said: 'Abu'l-Qásim does not want you; God protect you.' And lifting up the hem of His robe He shook it, and immediately all the locusts arose in a body and flew away. Abu'l-Qásim* referred to in this story is the first gardener who dedicated his life to the service of Bahá'u'lláh in that garden. He was a native of the village of Manshád in the district of Yazd. It was mainly through his hard work that the garden was built for Bahá'u'lláh. 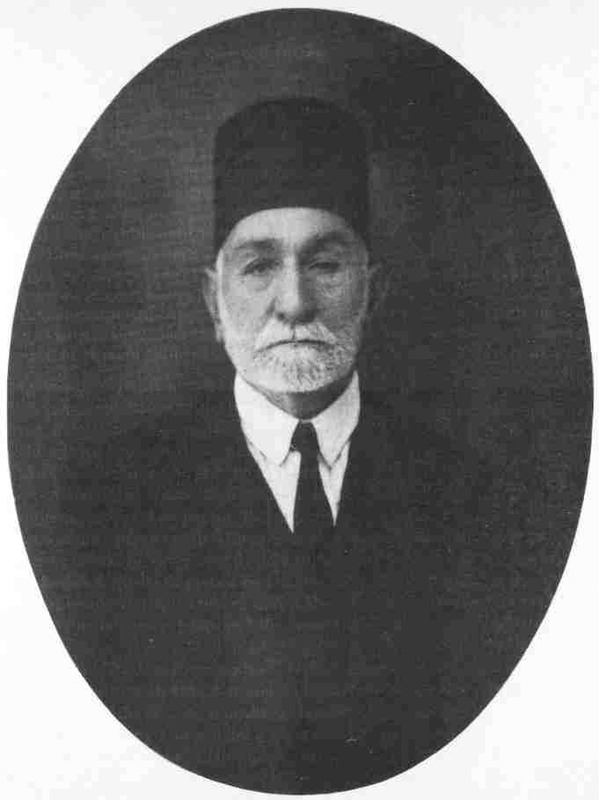 One of Abu'l-Qásim's brothers was Muhammad-Ibráhím who also served Bahá'u'lláh as a gardener at Bahjí and other places. * Not to be confused with the renowned Mírzá Abu'l-Qásim-i-Khurásání, who was the caretaker of the Shrine of Bahá'u'lláh and the gardens. † see below, pp. 118-25. ‡ He began writing this as yet unpublished history around 1902. * Qur'án 21:68. This verse is about Abraham being thrown into the fire by his people, when God turned the fire cold.